Brew of The Day: SALE ALERT - SM ACCESSORIES Fashion Jewelry SALE up to 50% OFF! SALE ALERT - SM ACCESSORIES Fashion Jewelry SALE up to 50% OFF! Hey Coffeeholics! With the month of May comes lots and lots of sale. And yes, that's a good thing especially if you are preparing for something for your mom. 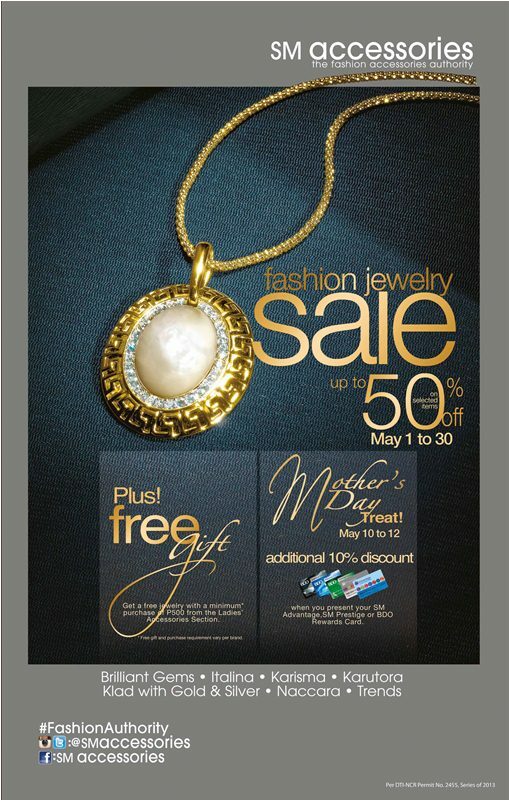 Well good thing that we can always find something grand to give to our moms here at SM Accessories. SM Accessories will be having a FASHION JEWELRY SALE up to 50% OFF on selected items. This will be happening on the whole month of MAY. On May 10-12, will be a Mother's Day treat as they will give an additional 10% off when you present your SM Advantage, SM Prestige, or BDO Rewards Card. Awesome huh? PLUS, get a free gift when you purchase around P500 or more from the Ladies' Accessories section. Also check out this funny and cute video clip on how accessories really can transform your day look to an awesome night look!